Through all of my life I have been interested in the occult, especially with regard to ceremonial magic and the Western Esoteric Tradition. In 1960 I met Robert Turner whose interest was as strong as mine. We each developed along different but complimentary paths, joining various organisations, gaining both knowledge and experience until we felt confident enough to form our own group in Wolverhampton in the late 1960s. 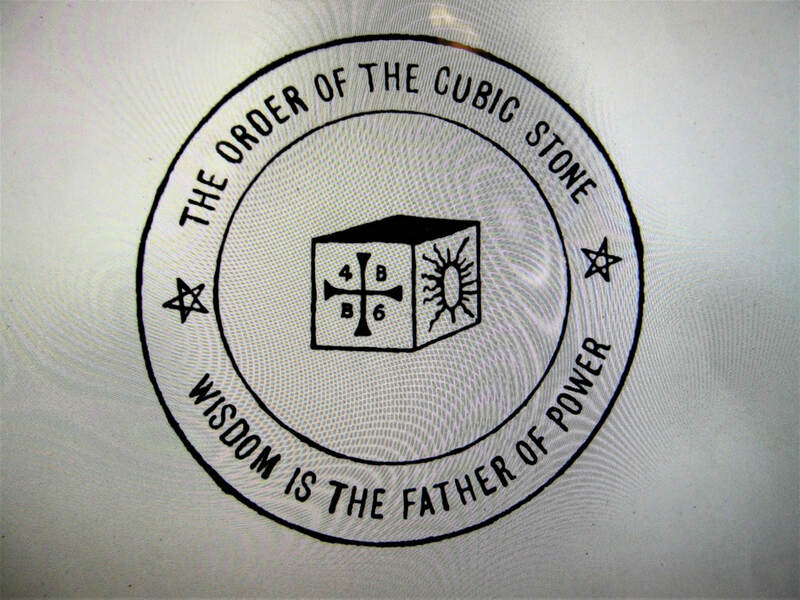 This was The Order of the Cubic Stone (O.C.S. )whose motto is ‘Wisdom is the Father of Power’. In many ways it was loosely based on an organisation known as The Hermetic Order of The Golden Dawn, adapted for ceremonies equally as structured but for smaller groups of initiates. There was a full system of initiated grades with an inner egregore reaching out into spiritual realms of wisdom and inspiration. Robert and I evolved a graded teaching system with lectures, ritual meetings, both seasonal and developmental. On evening lecture occasions, there was always a talk by both of us. To satisfy this need we wrote many papers, printed and published our magazine, The Monolith, various booklets which we later developed into commercially published books. A particularly example was my book ‘Dare To Make Magic’ originally published by Rigel Press. Several of Roberts works have been translated into various languages. Although no longer an active member of the O.C.S. I still associate with members who share the same overall principles and contacts. My interests have diversified from large scale ritual and the complexities of The Enochian System of Magic, upon which the Order has done a great deal of research, towards a smaller but equally potent stream of magic, loosely known as the Annals of Time and Space. Francis King in his book Ritual Magic in England, writing about the poor quality of many modern magical groups, in contrast to organisations such as the historical Order of The Golden Dawn (probably the best known magical group to have existed) says "There are exceptions to the mediocrity, the most notable of them being the Order of the Cubic Stone which operates in Wolverhampton." He continues favourably with further details including an example of a complex initiation ceremony experienced by Robert Turner during the grade of Adeptus Minor. ​nb. An erroneous article about the Order of the Cubic Stone circulating on the internet says the society was formed in the 1930s. Neither Robert nor myself were born at this time! RE THE IMAGE OF THE OCS SEAL AT THE BOTTOM OF THE PAGE. ​Wisdom is the Father of Power is the motto of the group. The entire image was always printed on all OCS documents and rituals etc. HISTORY AND PROCEDURES OF THE O.C.S. With the progression of time, I have decided to include some historic facts about the Order of the Cubic Stone, its manner of operation, courses of lectures and papers presented to initiates. Also the type and style of ritual ceremonies performed by members, some of which were necessarily restricted to relevant grades, will be listed. At this point, these will be discussion points rather than fully itemised procedures. As our experience and opinions changed, so the lecture programme etc was modified and adapted to suit members and personal knowledge. One reason for developing this page is that the egregore and thought forms associated with the OCS still exist. Discussion with similar minded friends may well help to awaken contacts within your own psyche. A vast reservoir of knowledge and magical procedure is accessible by meditation and a search for the hidden contacts using symbols in regular use by the group and their adherants. Midway through the ritual Key 1 from the OCS version of the Enochian system occurs where it is often the first introduction to this form of ritual for newcomers to the group. The ceremony continues with purification and opening of the Vault of the Adepts. Also included is an invocation of the Sun before the lesser Pentagram Ritual brings the ritual to a close and initiates present partake of the Elements. Despite being open to all initiates, it was a powerful introduction that always impressed neophytes. After a brief period renting a small house in Wolverhampton, Robert and I moved to a much larger structure on the A449 close to the Stubbs Rd traffic lights. The building had two large bow fronted rooms facing the road ,the down stairs one being used for our library and lecture room. The large bedroom above this was our temple which, as well as standard magical ornamentation and colours, had one wall as an symbolic vault of the adepts. Although its hexagon decorated door could be opened, this was always treated as symbolic. Central to the temple was a full sized altar in the form of a cube and with the appropriately painted elemental symbol filling each facet. The temple had a dark floor, on which appropriate symbols could be added when necessary. Up to 12 initiates could easily be accommodated but it was also comfortable for smaller rituals with more experienced magicians. A photograph of the building is in the photo album section. ……"Say after me: I (name in full) do most solemnly swear to honour god, my maker and to be obedient to his most holy will; to respect and obey the laws of the of the Order of the Cubic Stone. Unto the wardens of the order, I pledge my loyalty. I also swear that in all my ways I shall be true, faithful and helpful unto my brothers and sisters of the Order. Lastly I most solemnly swear to keep secret and never reveal to any one other than a brother or sister of the same grade as myself, any of the rituals and workings of the Order of the Cubic Stone. I swear this by my honour amongst mankind, my hope of the great life to come and in the name of god most high and I devote myself to utter destruction in the Waters of Chaos should I break this my most solemn oath." Guide then draws invoking pentagram on the forehead of postulant, before consecrating him with oil. The neophyte is then formerly welcomed into the grade and the group continue the ceremony by performing the invocation of the Fifth Enochian Call. Various dedications for ritual working were used by the OCS. The first one is for use with rituals such as those of Mars which are concerned with dynamic force , or for the protection of the Order or any one within it. "Let the Order of the cubic Stone be a shield against danger from those who oppose us who serve in the Pathways of the Light. Let the Sword of Righteousness be ever guarding the Mysteries from the profane. Let the OCS be a dwelling place for those who serve the One True God and let it also be an abode of peace where no adverse force can enter. May the boundaries of the egregore of the Order be impregnable except to those who serve the One True God. Let the wisdom of learning be protected by both those on the inner and those on the outer levels of the Order. This next dedication is one that may be used when no other is relevant. It may also be used in conjunction with any of the other two dedications (not shown here) and is appropriate where the ceremony is one of benevolence. "Let the Order of the Cubic Stone be a pathway to the light for those who seek truth and Wisdom. Let our hearts and minds ever hold before us the True Spirit of Brotherhood and Fraternity, remembering that although we each pursue our individual paths, it is as an Order that we work. Let us work as one for it is One whom we each serve. When apart from one another let us still feel and remember our brothers and sisters in the Order, for they each have something to contribute for the benefit of all. Let peace and harmony be amongst us, my brothers and sisters as we work together in the service of the One True God. Let our foundations be wisdom and let our strength be that which directs our wisdom wisely and in the service of the One True God." Amen. 2. The Tarot, part 1, Involution. Karma & Reincarnation. ​3. The Four Worlds & colour Scales. Tree of Life The Tarot, part two, Evolution. 4. Kameas & Sigils, re Talismans Discipline & responsibilities. Magical Personality. Robes. 5. Malkuth; analysis of table in 1st year book. Four Ceremonial working from 1st Grade Book. part one. ​6. Goetia. Ceremonial working from 1st Grade Book. part two. 7. Travelling in the spirit vision using Tattvas. Astral Triangle. Four elemental grades. 8. Magical Weapons. Circle of Art. The Tides. 9. Temple symbolism: An analysis. To be arranged. dependant on progress of students. 10. The Gods of Egypt. Explanation of the Mass of Saturn.. General revision. 1. INITIATION followed by a brief exposition of 2nd Grade Book of Wisdom. 2. General principles and things to be observed Dogmatic Qabalah. The concept of the Divine Being. concerning the 2nd Grade. Yesod. 4. RITUAL FOR SPIRITUAL DEVELOPMENT. 6. Use of Archangelical Force with particular regard The Ceremonial aspects of the Second Grade Book of wisdom. 7. Geomancy. The Elemental Kingdoms. 8. BORNLESS RITUAL FOR THE INVOCATION OF THE HIGHER GENIUS. 9. Thought forms and Artificial Elementals with regard Harmony of the Spheres, with reference to Divination. 10.The Egyptian Cosmos. Path Working (in and around the Astral Triangle). 12. CONSECRATION CEREMONY FOR THE JUPITER TALISMAN. NB. All lectures will be biased towards the Sphere of Yesod and/or Divination. LECTURE NOTES FOR 2=9 ZEALATOR ON PRACTICAL TALISMANIC MAGIC 1. Recap of first grade lecture . and Talisman as a link. 2. Summary of Ceremonial method. d. Invocation e. Use and purpose of Talisman. f. Project force in sign of the Enterer and protect with Sign of Silence. g. construction of body for Talisman. h. Sign of the Rending of the Veil. I. Close (Appearance of light over talisman. for force and the need to be in tune. c. Also to be considered :- The use of Talismans, means of concentration, strength needed' use of demonic forms, Magnetic effect, Channel for force to flow. The purpose of these exercises is to amplify the virtues associated with particular images. The first instance involves the 9th Tarot Key of the Hermit as a god of wisdom. Here we are trying to assimilate aspects of our chosen form and to merge these with ourselves by assuming the generated magical image. Start by drawing or painting the god or other character involved and have this in the room with you when performing this exercise. Alternatively the image from a book may be substituted. The larger the better. Then spend a while contemplating, assuming the same bodily attitude and trying to merge with the image. Take as a god of wisdom, The Hermit, and imagine it as a man wearing a cloak of dark blue. His right hand holds a lantern of wisdom while in his left is the staff. The easiest source of this image is obviously the appropriate Tarot Card. Repeat the sentence from Psalm 105. 'Thy word is a lantern unto my feet and a light unto my path.' Now imagine the light flowing onto your feet and, use this as a guide into the future, helping you to avoid any difficulties facing you. Now mentally lift the light above your head to clear your pathway of any danger or uncertainty. Repeat the sentence from the psalm several times. Them merge your awareness with the main figure of the Hermit and let the flow of inspiration, knowledge and guidance permeate your own magical personality. There are ample diagrams of Osiris in books on Egyptology or in many magical books. In some ways Osiris is the Egyptian form of Christ. Study the picture you have obtained, notice his clothing and any insignia. Imagine you are in the Shrine of Osiris with linens still wrapped round the body as though in a tomb. Here we have a symbol of resurrection and immortality. As you sit in contemplation, feel the white crown of the South on your head; in your hands are the crook and flair (symbolic of chesed and Geburah on the Tree of Life). In practice you may find it preferential to lie down in this instance. Gaze out upon world with a calm, unwavering vision. In this place the Holy Silence of Eternity now envelops you and the True Principles upon which all manifested action can be judged are laid bare. No shadow of fear or desire can disturb this holy calm. Nothing but Absolute Truth on which any judgement is made is present. Yet any contemplation is not based on Severity because it takes account of weakness and lack of opportunity. Neither is it based on Mercy that would ignore deliberately wrong doing. It is the sentence of Absolute Truth and is therefore based jointly on Mercy and Severity. This judgement is said to be the best we can do within the limits set by our destiny. This imagery is exceptionally potent. You need a very still mind to assume this god form. Be at peace before you begin and think deeply about any inspirational results you experience. When I first met Robert Turner, we instantly gelled and found we both had a total fascination with the occult. In those days there was little availability of books on the subject and we travelled the length and breadth of England looking for works such as The Golden Dawn, The Clavicule of Solomon, Abramelin the Mage and similar. During this time we met and corresponded with many other devotees including the author Colin Wilson and one particularly fascinating character, Cecil Williamson who was the original owner of the well known witchcraft museum in Cornwall. I still have a vivid impression of Cecil wearing an advertising billboard and tramping the village streets. When we visited his house perched on the cliffs overlooking one of the most scenic areas of the neighbourhood, it was one of the most expensive properties in the area. Robert became involved in Gardnerian Witchcraft, while I hovered on the outer fringes of The Society of The Inner Light. I must apologise for including references to myself, but in those days our lives were very inter linked. That apart, Robert also travelled independently and made other contacts both in London and with the witch cult on the Isle of Man. We began experimenting together with our own form of ritual magic. I always had total confidence in Robert both then and for the rest of his life. I liked to feel he had similar feelings about me, for there were times when some of our ceremonies conjured up entities better left untouched. We survived, had fun, learnt a great deal, in the process becoming much wiser. Robert and I went our own ways periodically, dipping into different aspects of the occult to suit our own temperaments. During one of these periods, Robert met Theodore Howard (now deceased) who introduced him to the Enochian System of Dr John Dee. From then onwards this became, outside of the Order of the Cubic Stone, Robert’s main interest, involving many trips to the British Museum and similar, studying original mss and eventually writing and publishing books on Elizabethan Magic and John Dee. Since this website already includes details of Robert and the OCS, I make no apology for little mention here, other than to say many hours were spent arranging lectures, ceremonies and writing magazines and booklets. Robert met and married Patricia Shore, another accomplished initiate and psychic who became very involved with the OCS. Their two children, Neil and Anne, though, have no leanings in this direction. Unfortunately, some years ago, Robert was attacked and badly injured in Wolverhampton one evening. He spent four days on a life support system and his world changed drastically for the worse. Despite this, his interests never altered, although in some of our regular phone calls we talked more about broad beans, which he grew in his garden, than the occult. Robert also possessed a photographical memory and was frequently critical of other so-called authorities and the inaccurate details in their books. Robert was a worthy contributor to occult lore and tradition. His works and achievements remain for future generations. Robert Turner will be missed by all who knew him and particularly by his family and those associated with The Order of the Cubic Stone. I shall miss Robert for who he was – my friend.